HomeInspireDid GOD Grant Permission To Satan To Attack Job? And Did GOD Engage Satan to Attack Job? Article Message: Did GOD Provoke Satan To Attack Job? That same one being perfect and upright in the Sight of GOD, who had feared GOD and eschewed (shunned by choice) evil. PART ONE: Did GOD Provoke Satan To Attack Job? PART TWO: Did GOD Provoke Satan To Attack Job?……..REALLY?? PART THREE: Did GOD Grant Permission To Satan To Attack Job? Did GOD Engage Satan to Attack Job?……Christian ‘Madness’ in Friendly Fire!! For obviously, it breaks down to this Evil Satan’s destruction of Job, and then Job’s subsequent GOD Blessed Restoration, that being twice as much as he had possessed, owned before. And once again, even to have been blessed over the natural passing of time after this, with a family of another seven sons and three beautiful daughters. And yes, this with the same wife!! Simply miraculous indeed, the world had ever seen up to that point, specifically, as in that part of the world, Job’s world. For there was another yet Greater Miracle on the way, in the faraway horizon of time, some 3,800 years later to be. This when our GOD and SAVIOUR, YHSHUA MASHIAKH would be born then, GOD in the FLESH!! Into this world, and this through a Virgin Jew woman, Marie, who knew no man though having been betrothed at the time, becoming the wife of Joseph, until after YHSHUA was born, yes through her!! 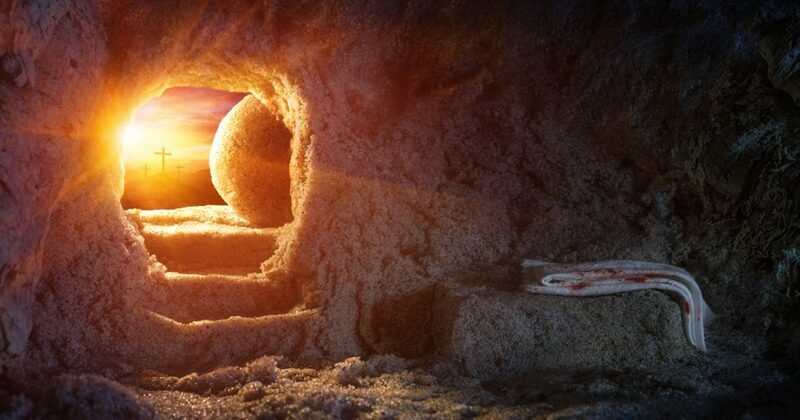 This Greater Miracle, was simply out of this world also, some 2,000+ years ago from us now!! Simply miraculous indeed, the world has ever seen even as of now. And yet, Job had amazingly in such awesome Spiritual knowledge knew of YHSHUA, though he knew of HIM as being, ‘My REDEEMER LIVES’, as evidently already shown in the previous Part Two. Please read this, if you have yet to do so, and even Part One as well, to amazingly discover what Job knew at the time of the ‘future days’ to come. The first family of seven sons and three daughters, were lost indeed, all of them on the very SAME DAY – killed by Satan. He in having engaged, channeled a great wind from the wilderness, to be evilly harnessed, forcibly in such destruction, onto the four corners of Job’s eldest son’s house, that they were all in at the time. Bringing it down abruptly, suddenly, crashing over all of them, in this horrendous devastation – killing them all on the very same day. Author’s note on this: Satan did not create or generate the great wind, or anything else whatsoever for that matter. For GOD only is the Creator of everything, and this Creation began, all from nothingness, ex-nihilo as GOD had Spoken it into such existence through The WORD. Yet Satan did harness it for his evil purpose. For Satan is evidently as seen here, quite able to use what is already available, for his evil ways. As another example, such as, when he used the ‘fire of GOD’, which he had done so, not created but did, to burn up Job’s sheep and the servants as well. All those probably tending after Job’s sheep, as located in the specific place at the time. This too as well though a bit earlier, was also part of all of this Satan’ destruction having been brought over Job. This also includes the raiding attack of the Sabeans, and then followed closely as well by the Chaldeans in different areas of Job’s properties and livestock. They took away all the stock, and killed all the servants, except for the respective single messengers left from each area to return with this news to Job. This is the Spiritual reality also, of us being privileged Believers in GOD ALMIGHTY, as in CHRIST JESUS. This as we live in this world as clearly evident, in this very Scriptural hindsight, that comes to us as just shown, through the Biblical Book, JOB. Yet, taking Author’s note to mind, that not at any time did Job himself, had ever come to be knowing this at that material time. That Satan was indeed waging his personal war or any war, to being his personal vendetta against GOD!! This for having been cast out of heaven, of which YHSHUA saw Satan as lightning fall from heaven. Luke 10:18 confirms and 2 Peter 2:4 supports this, as they, the fallen Angels were cast down to hell. 18 And he (YHSHUA) said vnto them (the Seventy others, as appointed by YHSHUA – Luke 10:1 refers…), I beheld Satan as lightning fall from heauen. And this was not a vision as many teach, but YHSHUA physically saw this happening in such aeon times passed, for Satan’s own evil connived violation against GOD. Also by this default, this further testifies and confirms among many other Scriptures, that YHSHUA is the ONE – WHO IS and WHO WAS and WHO is to come, The ALMIGHTY – Rev 1:8, 4:8, 11:17 refers. Amen. Satan now waging this war through Job, yes Job, to get back at GOD in some evil way, at every chance that he can get. And so not limiting to Job only. With the central focus of still attempting in this to be replacing GOD on the THRONE of GOD!! If at all this to being ever possible, yet Satan evidently thinks so through his evil, in his Satanic evil madness……!! However, to examine all of this and more, in such imposing and daunting detail, will indeed take a huge effort, and time, not only mine but yours too as well. And therefore, I am compelled to leave this out and much more content still, until a Book be accomplished in the GRACE of GOD at some time later. Therefore for now, in the continuation of the above Biblical string, Job was totally oblivious to this situation of War, as having been first initiated and waged as such by the Satan against GOD ALMIGHTY, beginning in the very Heaven. Let alone, this now that was over himself. Yet in this local sense, this War had now been brought to him, to his household and his every possession, as he and all of his to being this very battle ground fronting, in this evil war continuity, yes, against GOD ALMIGHTY!! Therefore, in such reality, each of us having become such privileged Believers in GOD, as in YHSHUA MASHIAKH, are indeed most evidently now Satan’s battlegrounds as in many fronts. Yet this still solely against GOD ALMIGHTY in this very default. I hope you can see this! And if you do, GOD BLESS you. Consequently, this was also the very reason at that ancient time, for Job’s perplexing quandary over the devastation that had come so horrendously over him. And this too, practically overnight, in such suddenness you could say actually. Yet this, had become somewhat clearer to him, however, in the final ending Chapters, when GOD began speaking to him from the Whirlwind. And he himself had confessed this earlier lack of understanding, in fact to GOD, as in the very last Chapter 42. As he surrendered everything into the Omnipotence, Sovereignty of GOD over everything. The best that Job could do in his time and in his circumstances. Yet more significantly, due to because of the lengthy discourse that GOD ALMIGHTY had with him, in having explained all of this to him in so much of Sovereign detail. And yes, Divine Patience really. Another aspect, which should be added here really of GOD’S Sovereignty over everything, to being HIS – Omnipatience!! PRAISE GOD. And this in itself, GOD Speaking out of this Whirlwind, was indeed a phenomenal Biblical event. For I am sure it was to Job, on that day, though many have missed this to being as such!! Just as it was as well too, with Eliphaz the Temanite. The ‘chief’ of the three friends having all come together earlier, to visiting Job, when they heard about this evil that had befallen him. So through Eliphaz, we have also a bonafide witness of GOD ALMIGHTY having spoken out of the Whirlwind. The Believer in GOD ALMIGHTY, as in YHSHUA MASHIAKH has to stand up, that is to fight the fight in faith, to lay hold on eternall life, in such belief, in such reason, with the fear of GOD Alone. And this through our own freewill, just as Job did in such exemplary Spiritual conduct as well, as to being a Trail Blazer in fact. Leading the way for all of us universal Reformed GOD Believing, as in YHSHUA Believing Gentiles. The Jews had many GOD Appointed, by Divine Election – Patriarchs, Prophets, Judges and even Kings to lead them on Yet we have one also in the OT, Job, yes Job!! – And yet, this in GOD’S Grace, GOD’S Mercy and through HIS unconditional Love for us, as each become accordingly by the WILL of GOD, empowered and guided by GOD THE HOLY GHOST. As in these such encounters against Satan and his cohort of devils, and against self also. Of which GOD THE HOLY GHOST, Job had never the Spiritual privilege at the time to personally experience!! Yet, has been given to us, and therefore, we stand very much stronger in such Spiritual advantage. This, since YHSHUA’ Ascension, and since the very Day of Pentecost. When GOD THE HOLY GHOST, having been sent from Heaven as COMFORTER to us, in such multiplicity also down the generations. This having been so, by the FATHER and the SON, YHSHUA. 21Make you perfect in euery good worke to doe (do) his will, working in you that which is well pleasing in his sight, through Iesus Christ (YHSHUA MASHIAKH), to whom be glorie for euer and euer. Amen. GOD ALMIGHTY in this account of the ‘DESTRUCTION’ of Job is not an unseen PARTY, or an uninterested PARTY. For indeed, if you are able to see this, GOD was in the vital role of “Umpiring” the freewill of Satan against Job, in HIS Omnipotence Sovereignty over everything. Though at the same, taking special care to Author’s note in this, that you need to also understand GOD’S Sovereignty was not responsible. Or rather engaged at any level in this ‘evilness’ as which was evidently perpetrated from start to finish, solely by Satan against Job, and all that Job had at the time. This is paramount in the accurate understanding of the Biblical Book, Job. If you don’t get this, then you won’t get to understand the Book of Job!! For this undeniably, was all Satan’s doing from start to finish. For the Biblical Account of Job in its ‘hidden truths’, the unraveling of the Spiritual mystery in it, unfolds and reveals this to us, in the GRACE of GOD. This ‘GOD Umpiring’ was specifically as mentioned, over that of the fallen and evil spirit being, the Devil, Satan a.k.a. the Dragon, the Serpent of old. And at that material time, GOD’S Umpiring Satan’s merciless evil activity, was for Satan not to being able to get his final say and doing in this devastation, that he had brought upon Job. That was obviously in this, not to be killing Job, quick and evilly at any first chance he gets. And therefore, Satan if not umpired as such accordingly, of which only with GOD this is possible at any time, Satan, would have certainly ended Job at, “Behold”. And if not for GOD’S continued…..only upon himself put not forth thine hand!! As in Job 1:12 accordingly. Behold, all that hee hath is in thy power, onely vpon himselfe put not foorth thine hand. That of Satan’s own initiated “Clash of the Wills” as mentioned in the opening. And that evidently would have ended, as mentioned just now, prematurely for sure. This before the GODLY outcome, yes GODLY outcome could be realized through Job. 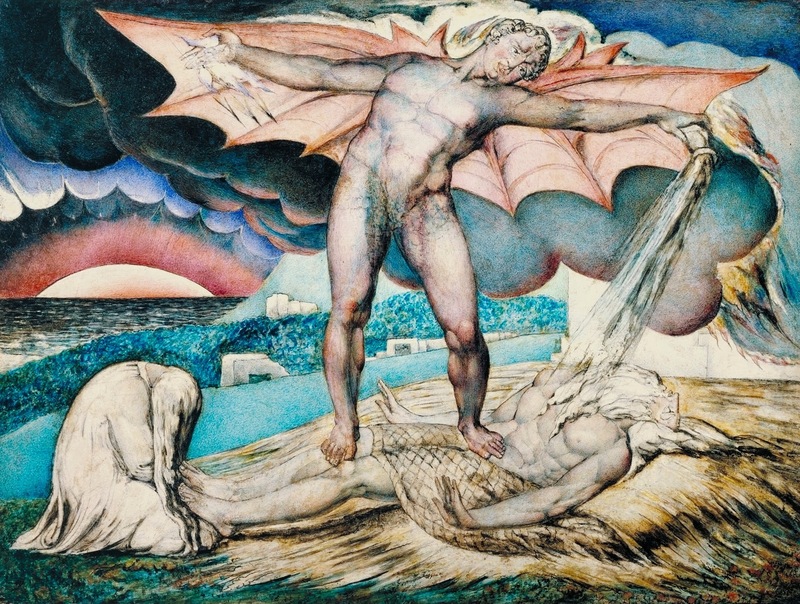 And this by Job himself, under his own freewill against Satan. The Scriptures testifying also to this, GOD was not in it, to be the cause of this devastation at any level per se, from the very beginning. For this was all Satan’s doing from start to finish. This having begun with Satan, even before his first reporting to GOD during this Job Biblical Period as evidently established in Part One. For the Good, with the Fear of GOD ALMIGHTY, will always prevail and triumph against the evil, when evil comes against the Good. 28And wee know that all things worke together for good, to them that loue (love) God, to them who are the called according to his purpose. 13When Iesus (YHSHUA) came into the coasts of Cesarea Philippi, he asked his disciples, saying, Whom doe (do) men say, that I, the sonne of man, am? 14And they said, Some say that thou art Iohn (John) the Baptist, some Elias (Elijah), and others Ieremias (Jeremiah), or one of the Prophets. 15He saith vnto them (HIS close disciples), But whom say ye that I am? 16And Simon Peter answered, and said, Thou art Christ the sonne of the liuing (Living) God. 17And Iesus answered, and said vnto him, Blessed art thou Simon Bar Iona (Jonah): for flesh and blood hath not reueiled (revealed) it vnto thee, but my Father which is in heauen. 18And I (YHSHUA) say also vnto thee, that thou art Peter, and vpon this rocke [upon this revealing of the FATHER: Thou art Christ the sonne of the liuing (Living) God…] I will build my Church: and the gates of hell shall not preuaile (prevail) against it. 19And I will giue vnto thee (Apostle Peter) the keyes of the kingdome of heauen: (this meaning of YHSHUA’ Church – The BODY of CHRIST, to the care and development of it from its first clear beginning, which would be on that very Day of Pentecost to come, as we know this in hindsight – 3,000 were added on that day YHSHUA’ Church!! This, because of Apostle Peter’s Sermon on that very day. When he boldly preached in the empowerment of GOD THE HOLY GHOST, the Sermon – YHSHUA Crucified, and was Resurrected on the Third Day…. 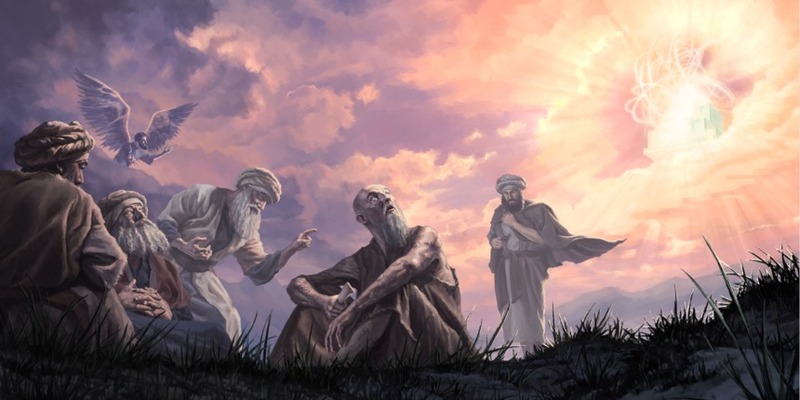 – the Scripture continues…) and whatsoeuer thou shalt bind on earth, shall be bound in heauen: whatsoeuer thou shalt loose on earth, shall be loosed in heauen. This could have been the very Headlines on any major Announcement, if made about 3,800 years ago by some major Global Media Network of today!! This to be building up also, the profound perception to be understood by us as well, that about 1,800 years later from Job, another Adam, the Second ADAM, GOD IN THE FLESH, YHSHUA will come to earth. And YHSHUA will crush, bruise the head of this very Satan for good, as Satan bruises YHSHUA’S HEEL in this ongoing War between GOD and Satan. The very same that which was initiated first by Satan and not by GOD. And this Job did too, yet only in the shadow of what was ahead through the ALMIGHTY, YHSHUA. Amen, PRAISE GOD. This first having been Prophesied as such in Genesis 3:15. This Scripture Prophecy was the very First Messianic Prophecy in the OT – The Protoevangelium. 15And I will put enmitie betweene thee (Satan) and the woman, and betweene thy seed and her seed: it (YHSHUA – SON OF GOD) shal bruise thy head, and thou shalt bruise his heele. Yes, Satan was finally defeated BIG TIME, and not by a Jew, but by a Gentile, and that also in early OT Biblical History time!! Do you sense some edge here in me, when I said that…..Well it is joy actually, that we were and still are in GOD’S Foreordained Plan. Though on a case to case basis then, but now, to having been reconciled and brought near to GOD. This together with the Jew also, in the New Everlasting Covenant, the Better Covenant than the former. And this liberated at the same time, no different from each other, through the Blood of YHSHUA MASHIAKH, having broken down the middle wall of partition between us, torn the veil not by man but by GOD from top to bottm – simply amazing!! Ep 2:10-22; Matt 27:51 confirms. Amen. PRAISE GOD. 10For wee are his workemanship, created in Christ Iesus vnto good workes, which God hath before ordeined, that we should walke in them. 12That at that time yee were without Christ, being aliens from the common wealth of Israel (..The Commonwealth Christians In YHSHUA – YHSHUA, the ISRAEL of GOD – Gal 6:16 as I read this…And this is why we go by this name. We are CCIY…), and strangers from the couenants of promise, hauing no hope, & without God in the world. 13But now in Christ Iesus, ye who sometimes were far off, are made nigh (near) by the blood of Christ. 15Hauing abolished in his flesh the enmitie, euen the Lawe of Commandements conteined in Ordinances, for to make in himselfe, of twaine (of two), one newe man, so making peace. 17And came, and preached peace to you, which were afarre off, and to them that were nigh. 18For through him wee both haue an accesse by one Spirit vnto the Father. 22In whom you also are builded together for an habitation of God thorow (through) the Spirit. 50Iesus (YHSHUA), when hee had cried againe with a loud voice, yeelded vp the ghost. 51And behold, the vaile (Veil) of the Temple was rent in twaine (torn, ripped in two), from the top to the bottome, and the earth did quake, and the rocks rent (split open). Well it is evident, Job did actually also come to finally understanding this overall arching Omnipotence, Sovereignty of GOD. And this also through the added dimension of experiencing this himself, personally in his own life, more than most of us would experience quite evidently. This through the circumstances surrounding and enveloping his life, from the devastating calamities, that were solely brought upon him, his family and his possessions in such wicked evilness. Not by the Sovereign GOD in any way whatsoever, but yes, by Satan from start to finish under his own direction probably together with some help from his cohort of devils. Though restricted by the Sovereignty of GOD, as already seen. And yet Job did not know or had considered at any time, this evil to have come over him and over all that he had at the time, actually was all from Satan, The Evil One, from start to finish!! For as far as Job was concerned regarding all of this devastation that had suddenly befallen upon him from out of the blue, so to speak, this evil was also from GOD ALMIGHTY in HIS Omnipotence Sovereignty over everything!! 21And said, Naked came I out of my mothers wombe, and naked shall I returne thither: the Lord gaue, and the Lord hath taken away, blessed be the Name of the Lord. 22In all this Iob sinned not, nor charged God foolishly. 7So went Satan foorth (forth) from the presence of the Lord, and smote Iob with sore biles (..boils: inflamed suppurating – forming pus, fester, swelling and very painful with accompanying high fever also. This caused by infection of hair follicle, or of oil gland in the skin…), from the sole of his foote vnto his crowne. 8And hee tooke him a potsheard to scrape himselfe withall; and hee sate downe among the ashes. 9Then saide his wife vnto him, Doest thou still reteine (retain) thine integritie? Curse (to bless GOD in a negative way) God, and die. 10But he said vnto her, Thou speakest as one of the foolish women speaketh; what? shall wee receiue good at the hand of God, and shall wee not receiue euill? In all this did not Iob sinne with his lippes. However, the Gospel Truth of this matter, this evil was not indeed from GOD ALMIGHTY, but all from Satan. It was all Satan’s doing from start to finish. In this Scriptural generated view and understanding, which I had just put up for you as above, you can certainly agree with me, without any shadow of doubt. This evil was not from Omnipotence Potentate – Sovereign GOD, but from Satan. For otherwise, as many also think similarly as Job, though Job in this had unknowingly, thought as such, for he knew nothing about Satan quite apparently, and of his evilness, unlike all others – Specifically, referring to Christians here in general. It would mean, instead of Satan attempting to prove this to GOD, that Job will curse HIM to HIS FACE, yet it was GOD HIMSELF according to ‘these’ – to have done this and yes, to HIMSELF!! That is to having Job to curse HIM to HIS FACE, as they have believed actually. Not just propositioning this to be the case, but outright believing, that it was GOD indeed WHO had brought this evil, this devastation HIMSELF, upon Job. For Job to then to be doing so, that was to be Cursing GOD, to HIS FACE!! This as guaranteed by Satan that Job will do to GOD, as and when GOD removes the Hedge of HIS Protection from Job. Satan, however unlike these ‘Christians’ did not say that GOD will then have to bring this evil upon Job also. For it is quite obvious, Satan was waiting for this Hedge to be removed, so that he could act immediately to bringing the downfall, not of Job per se in his devastation over Job, but of GOD ALMIGHTY!! This ‘thinking’, this false belief is what I had referred to at the very beginning of Part Three – Christian ‘Madness’ in Friendly Fire!! I am certain you can see now for yourself, the very evil defectiveness as exposed here, of this very ‘thinking’. This defective charge as made by this such madness, which does not even go well with Satan, the very obvious perpetrator of the horrendous evil brought over Job and over all of his at that time. And though this is of course crazy to even think about this as such. It is quite obvious, if GOD wanted this to be as such, GOD would not have failed at it, as it was with Satan, who had so completely been defeated by Job!! And if so, this would not have made the Headlines, for obvious reasons. As it would have been a foregone conclusion to be so, no big deal. GOD WILL TRIUMPH in Job’s world or anywhere else, hands down, and hands tied behind the back. Amen. Unless you do disagree with me, and agree with the others!! It is your Call…..
And yes, as you also Scripturally see, Job had brought such Glory and Honour to GOD, and had even said at the very height of his destruction, “Blessed be the NAME of GOD.” – Job 1:21. Amen, PRAISE GOD. Therefore, though GOD certainly punishes those who do wrong, Believers and of course Non-Believers who are already Judged as well, whilst still on this side of existence; GOD had never punished anyone, who had not done anything wrong in HIS SIGHT. This is the Gospel Truth also, unless you can show me differently with the Scriptural evidences for it. You are certainly invited to do so, in the Comment Section made available for anyone to contest this. Or better still to offer agreement as well, which I do sincerely welcome and certainly prefer most kindly, as we stand in Christian Solidarity on this. And more deplorable still, Christians, yes Christians in such ‘Friendly Fire’ against the rest of us who do think alike on this, which is a kinder and more diplomatic way of putting it, have not stopped here either. For they have gone ahead and charged GOD, many of them actually in a general sense, having agreed out loud, that GOD had engaged this Evilness, Satan, to do this devastation against Job, and all that he had at the time. That even over the innocent, that were all killed, not only his family, but also most of his servants as well and they were indeed many!! Simply outrageous indeed to blame this on the very Sovereignty of GOD – ALL JUST, ALL MERCIFUL, ALL LOVING GOD. With such GODLY intention, now please listen carefully, in order to bring Job, who was already declared as an upright and perfect man by GOD HIMSELF, to be drawn even closer to HIM!! Pure evil madness at its very height, sorry, just unable to use the politically correct – ‘Friendly Fire’ here. For this is Christian ‘Madness’, to have even suggested this. For this was as it is still, against the Sovereign Divine Benevolence of GOD ALMIGHTY. WHO had even given us HIS SON to Die on the Cross for our Sin. To Redeeming us from the captivity of Satan, from the wages of sin, from eternal death, the second death. As from all evil without any hope before, now to Salvation and Eternal Life in the heavenly places in YHSHUA MASHIAKH!! You please go and figure this one out…..Friendly Fire, you must be kidding me!! And yes, the Devil was defeated, good and proper consequently. This Job did, even without knowing at any time, that he was actually up against the Devil, Satan. And as evident in the above Scriptures, Job did not curse GOD, nor did he sin with his lips. Simply amazing, this Gentile Job. The Scriptures also tell us to do the same, yet knowingly of course, as in James 4:7. 7 Submit your selues therefore to God: resist the deuill, and hee will flee from you. Then as such at the ending of all of this destruction, which was at the sole hand of Satan, Job progresses even better than before, in the double portion restoration over his life, by GOD ALMIGHTY. And this after he had prayed earnestly, having interceded, and made such supplication – humble fervent petition, for his three Israelite friends, to GOD ALMIGHTY. That was due to their false accusations, that they having brought these upon him. And this, so aggressively also, in a non-comforting manner at any level, whilst in the midst of Job’s mourning, and in his such wretched personal state at the time. That with such terrible pus oozing out, from the infested boils, that were on him at the time, from the sole of his feet to the very crown of his head. And certainly, quite obviously with very high fever as well, without any such antibiotics quite obviously also available to him at the time. Only to be scraping himself with a potsherd, piece of pottery, and sitting on ashes to sooth his untold agony. Yet this Job had also prayed for them, his Israelite friends, not only for the accusations that they had brought against him. Yet that also which they had brought, in such mistaken pronouncements against GOD ALMIGHTY!! Their declarations, accusation, which were completely baseless, having been totally mistaken, misled by their Judaism related theology learning, upon GOD ALMIGHTY, EL Shaddai as known at the time to Job!! For they had declared to Job, that GOD was indeed punishing him for his ‘Big sins’ against GOD. And therefore as such, as a direct consequence of this, all this great evil devastation had come upon him, and this having been by GOD!! They will say this with such ‘holy’ conviction, that GOD was punishing the individual as such, when it could actually be Satan messing with the Believing individual at the time. This was just as what Satan had done to Job without a cause, which will always be the case – without a cause. This is Satan’s modus operandi against the Believer in GOD, as in YHSHUA MASHIAKH. If there was a cause indeed, Satan will not bother, for the ‘sinner’ has now moved onto his side of the divide, of good and evil. Even if this was just to the next confession to GOD, to be repenting and it better be timely!! Therefore, this wrong understanding of GOD in this matter of Job, in his devastation and suffering, had been completely rejected by GOD Himself, of this evil to have been of HIS Sovereign doing – Job 42, confirms all of this as will be shown below. That is to punish with such evilness without cause. 7And it was so, that after the Lord had spoken these words vnto Iob, the Lord said to Eliphaz the Temanite, My wrath is kindled against thee, & against thy two friends: for ye haue not spoken of mee the thing that is right, as my seruant Iob hath. 8Therefore take vnto you now seuen bullocks, and seuen rammes, and goe to my seruant Iob, and offer vp for your selues a burnt offring, and my seruant Iob shal pray for you, for him wil I accept: lest I deale with you after your folly, in that ye haue not spoken of mee the thing which is right, like my seruant Iob. 9So Eliphaz the Temanite, and Bildad the Shuhite, and Zophar the Naamathite went, and did according as the Lord commanded them: the Lord also accepted Iob. 10And the Lord turned the captiuitie of Iob (…which had included also healing him of the boils on his person for certain – which he was still suffering until this moment of praying for these friends, as he also made the offering of the burnt offering for them on their behalf…. ), when he prayed for his friends: also the Lord gaue Iob twice as much as he had before. 11Then came there vnto him all his brethren, and all his sisters, and all they that had bin of his acquaintance before, and did eat bread with him in his house: and they bemoned (bemoaned) him, and comforted him ouer all the euill that the Lord had brought vpon him (…obviously they too thought the same like Job – all of them had no idea yet of this Satan, the Evil One! !…We know better though through the Complete Word of GOD…Amen..): euery man also gaue him a piece of money, and euery one an eare-ring of gold. 12So the Lord blessed the latter end of Iob, more then his beginning: for he had fourteene thousand sheepe, and sixe thousand camels, and a thousand yoke of oxen, and a thousand shee asses. 13He had also seuen sonnes, and three daughters. 14And he called the name of the first, Iemima (Jemima), and the name of the second, Kezia, and the name of the third, Keren-happuch. 15And in all the land were no women found so faire as the daughters of Iob: and their father gaue them inheritance among their brethren. 16After this liued (lived) Iob an hundred and fourtie yeeres, and saw his sonnes, and his sonnes sonnes, euen foure generations. 17So Iob died being old, and full of dayes. And so it would not be a mistake at any level to also conclude here and now, that GOD did not grant Satan permission to do this at any time to Job, or even to ‘assisting’ Satan in this evil of his. It was all Satan’s doing in his own freewill from start to finish. And it is amply evident that Job had humanly, in his own freewill, withstood all of Satan’s attacks, as directed on him, his entire family and over his possessions. Even at the height of the full leashing of these such rapid attacks by Satan. And yet he did not for even a moment, turn to curse GOD, nor as to sin with his lips. Meaning, even in his very heart and mind as well. Remembering, Job did not know this was of Satan’s evil doing, but in this reality, it actually does not matter. What mattered was that he did not let up in his feareth GOD. And in his escheweth evil – not transgressing against GOD ALMIGHTY in any sin, sinful way. Amen. Satan was clearly outclassed, defeated in his own evil strategy this time round. Unlike the earlier time with his encounter with Eve, and then as he had cunningly strategized, Eve with Adam – that brought the eventual fall of all humanity!! That which he also tried again with Job’s wife, against him as well, as seen in Job 2:9!! But this time it failed. Therefore, this Biblical Job Account is also in its essence, about the Gentile, GOD Believing Job, through his own freewill, defeating Satan without GOD’S Sovereignty assistance either, directly over him. Though, taking into careful account, that Job was not totally abandoned by GOD per se in all of this. For Satan was not allowed to take his life. Meaning also, of his overall ability to continue living. And GOD having restrained HIMSELF as such in HIS Sovereignty, when having removed the Hedge of HIS Protection, though this was at the deceptive request of Satan. Yet GOD did so, for the very reason, so that Job would be evidently seen not to have sinned, even as such, without HIS Protection and Favour. And significantly, through all this devastation that would certainly follow, not to turn and curse HIM as Satan so evilly confident had asserted to HIM. Yet Job prevailed, in all this, through his own freewill choices to make. This answers the “WHY? ?”, that many keep asking, “Why did GOD remove HIS Hedge of Protection? ?” More of this in greater detail, will be revealed in the Book that is still a W.I.P. This Gentile Job, unmistakably leads the way for us all to be remaining steadfast, no matter what that may befall us from time to time. To be aware also that GOD will never leave us or to forsake us, even during our trials and tribulations that may come our away. To remaining in HIS Marvelous LIGHT, in and with the Fear of GOD, holy reverence of GOD. And like Job, to eschew evil always, to living a Sin Free Life in YHSHUA MASHIAKH. PRAISE GOD. It would also have been most interesting, if only GOD had allowed us to also see, what had unfolded in the very next Satan’s reporting to GOD in a heavenly meeting place…….!! Keep in touch and Keep the Faith. See you in PART FOUR in the next few days, GOD Willing! How to be an Awesome Leader in Business?